Probably all that needs to be said about the quality of Delta Force 2: The Colombia Connection is that Colombia has nothing to do with the movie. Instead, this routine Chuck Norris action flick is set in the fictional country of San Carlos. It would not matter if the setting was a retirement home for the deaf in a suburb of Topeka: at the end of any Norris movie, Norris will blow up whatever the main set happens to be. Drug lord Ramon Cota (Billy Drago) pretty much runs San Carlos, aided by the country's chief general and a weak president happy to turn a blind eye. Cota exports large quantities of drugs into the United States, and runs circles around the efforts of the Drug Enforcement Agency to put a stop to his activities. 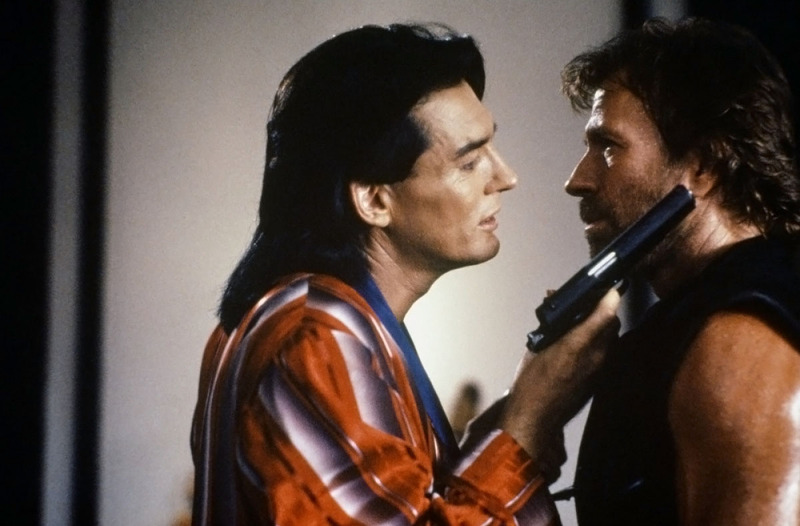 The DEA turns to Delta Force for assistance, allowing Major Bobby Chavez (Paul Perri) and Colonel Scott McCoy (Norris) to extract Cota into the US. He is promptly released on bail and immediately unleashes a vicious revenge on Chavez and his family, and takes a few DEA agents as hostages for good measure. Enough being enough, McCoy and a small Delta Force contingent, with the help of the eccentric General Taylor (John P. Ryan) commanding a single helicopter, infiltrate San Carlos on a mission to raze the drug plantation fields, destroy Cota's mountaintop headquarters and rescue the hostages. Arriving at the end of the era of mindless B-movie action shooters churned out by Cannon Films, and costing the lives of five crewmen in a tragic on-set helicopter crash, the sequel to The Delta Force is less ambitious, more routine and certainly more predictable. But the film does manage a couple of things well: Ramon Cota is a suitably abhorrent evil character, well portrayed by Billy Drago, and the Lee Reynolds script takes the necessary time to build him up into an enemy worth eliminating. As well, there are a couple of terrific martial arts sequences, the best a showdown between McCoy and Cota's chief henchman Carlos (played by Rick Prieto with a severe case of bad haircut). But everywhere else Delta Force 2: The Colombian Connection lives down to the minimalist expectations, and then stoops even lower. Director Aaron Norris ensures that the helicopters never run out of rocket ammunition and that the same bad guy extras die a dozen times each; and captures dialogue straight from the school of monosyllabic muscular tough guys. The supporting actors are plucked from the "where are they know" files and the "hire anyone with a pulse willing to appear on film for next-to-nothing" system of casting. There is also a badly handled sub-story about a local woman who loses her husband and child to Cota's atrocities, but her long quest for revenge ends with an anticlimactic fizzle. Topping off the list of absurdities is an astonishingly bad performance from John P. Ryan, who appears to have wandered onto the set thinking that this was an outright comedy. His General Taylor alternates between touch-feely, goofy and just plain deranged, and in another script he would be the bare-assed asylum escapee pretending to be a military man. Depending on the definition of entertainment, John P. Ryan as General Taylor is almost reason enough to watch Delta Force 2.